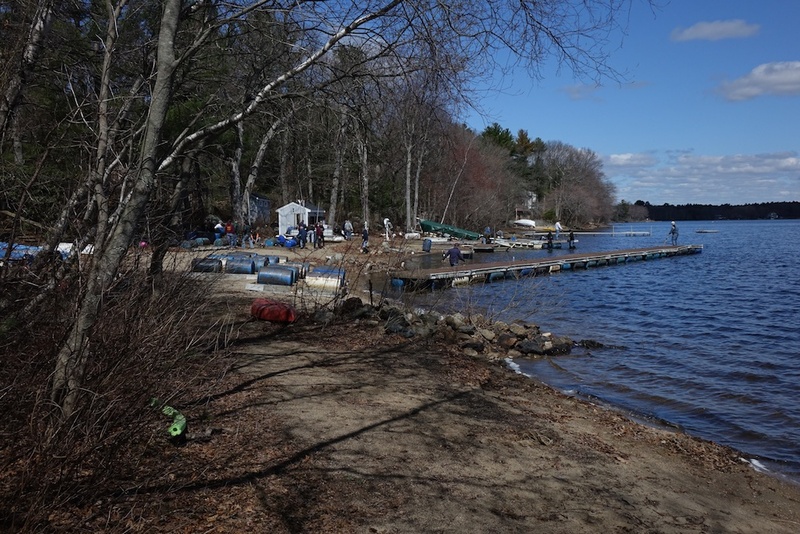 Massapoag Yacht Club opened for the season today, as about 80 members, plus the Sharon High School sailing team, gathered to put together the docks, set up the clubhouse, clean the grounds, set the moorings and do a thousand other things that make up the Spring Work party. Rear Commodore Eric Hemmendinger proved to be an able drill sergeant, seemingly appearing at several areas of the club simultaneously to direct the efforts of the members. This egg would make a huge omelet! While the club itself fared well, the brutality of this past winter took an unexpected toll on the Laser fleet. The weight of nearly four feet of snow was too much for several Lasers. When the tarps and boat covers were removed, we found several Lasers looking like so many cracked eggs. A number of dollies were flattened as well. At least three of the Lasers are considered total losses, and a couple more were damaged, but can be repaired. Only two or three Lasers were undamaged. 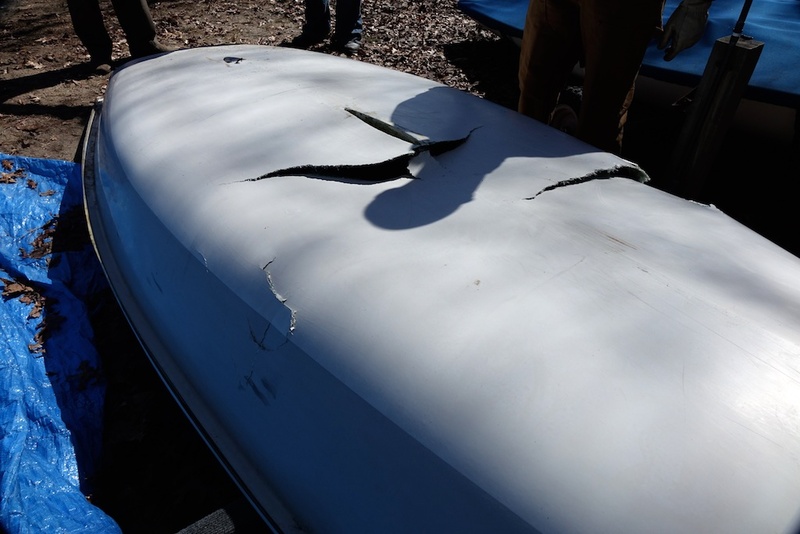 Two for the three Sunfish stored in the same place were undamaged, and the third only suffered very minor damage. 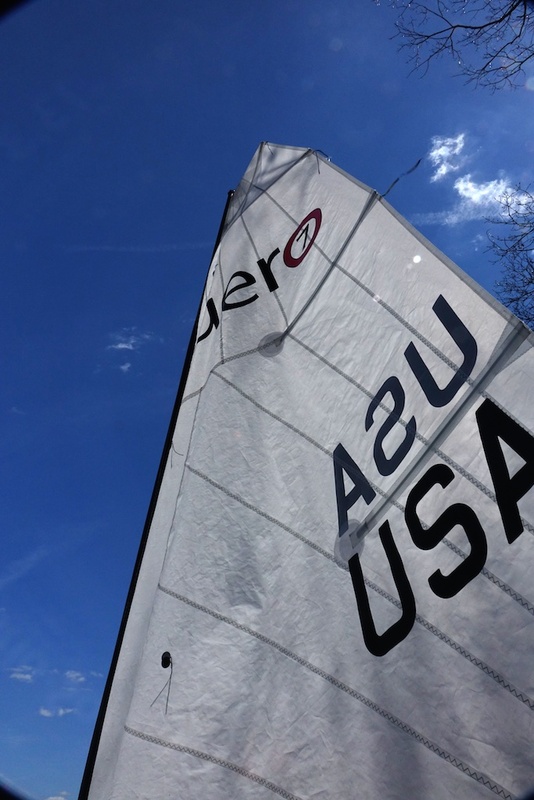 Providing a welcome distraction from the carnage in the laser fleet, Gary Werden showed up with the latest offering from RS Sailing, the Aero. Designed as a "21st Century Laser" this 66 pound wonder gathered a lot of attention. Getting in close to see the boat was tough, as everyone wanted to get a good close look. Gary offered test sails, but only one person was equipped and brave enough to test the boat in the 50 degree water. The boat looks to be well thought out, with all of the control lines within easy reach of the cockpit. The kick up rudder pulls down into position with a line on the tiller, so you don't have to lean out over the stern to get the rudder down like you would on a Sunfish. Water clears out of the cockpit and stays out with a piece of brain dead simple engineering. The Aero is a new fleet this year at Massapoag, and we should be seeing a lot of them. Don't forget that the spring tuneup series starts Sunday May 3rd 1:00. Also, next week is the last week of Sunfish frostbiting at Barrington. Sunfish sailing will be on Sundays from next week until June 6, when the Saturday series starts. We've moved the start time or the Saturday series from 3:00 to 2:00pm, so don't be late!